In a keynote speech delivered last weekend in Wausau, Wisconsin and posted on YouTube yesterday, the Democratic mayor of Elk Grove took swipes at California Democratic politicians and his colleagues on the city council. 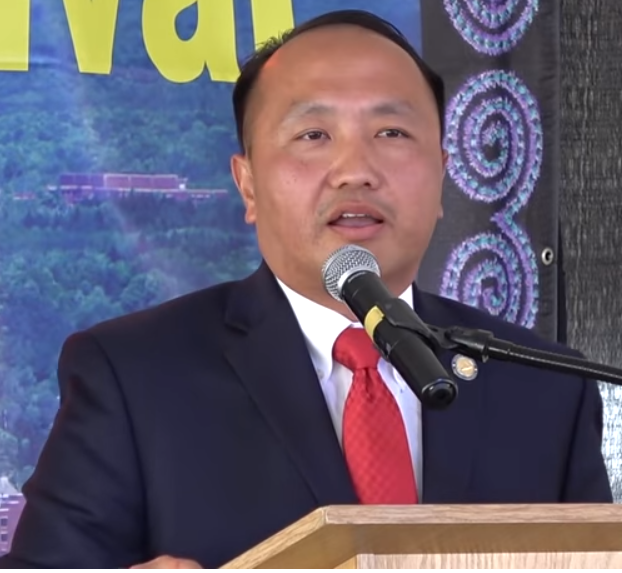 The comments were delivered at the Wausau Hmong Festival by Steve Ly. The mayor took his swipes in the opening minute of his speech first at his city council colleagues, then elected officials in California. "I am so impressed with the number of elected that are here," Ly said. "I wish in California we could get all the electeds to cooperate because as mayor it is always a challenge to get two council members to agree on anything, is a feat in itself." Along with criticizing his colleagues and California elected officials, he also implied that the Hmong-American community, which Ly identifies himself as part of, are more appreciated in Minnesota and Wisconsin. Ly noted that California has the largest Hmong-American population in the United States. "Because we are scattered throughout the state, people often assume that Minnesota or Wisconsin has more Hhomg individuals," Ly stated. "But nonetheless, it goes to show that the electeds and government official in Wisconsin and Minnesota probably loves the Hmong community a little bit more than the state of California." No sooner had Ly finished his comments criticizing elected officials in California, switching between English and Hmong, Ly noted a program funded by taxpayers in the Elk Grove Unified School District's recording Hmong history. "We have a 'Time of Remembrance' videos in which we recorded many of the refugee stories," Ly boosted. "So for any teacher in the world who wants to use this as part of the curriculum, it is readily available online and it is free." Later in the speech, Ly also criticized California for their failure to recognize Hmong veterans who fought for the United States in the Secret War in Laos during the Vietnam War era. "Probably, to be honest with you, California is probably the furthest behind," he said. While noting the accomplishments of Hmong Americans, Ly said of himself "only can a hillbilly and the Hmong's of Laos can stand before you as a law school graduate, as a mayor." Interestingly, Ly, a Democratic party member, implied elected officials in California, a state where all statewide constitutional offices and a majority of the State Senate and Assembly are in the hands of Democrats, are unable to govern. However, in the last several years, led by Democratic Gov. Jerry Brown, the state has passed timely and balanced state budgets. Conversely, Wisconsin has increasingly shredded its progressive political heritage. Under the leadership of conservative Republican Gov. Scott Walker, labor unions have argued that Walker has become hostile to workers by instituting measures such as so-called right to work laws and stripping public employee unions of their rights. A recent edition of National Public Radio's Fresh Air highlighted how Wisconsin transformed from a bastion of Democratic and progressive politics to one of three states that helped Donald Trump win the presidency. The title of the Fresh Air episode is titled How Dark Money, Gerrymandering And Democratic Complacency Altered Wisconsin Politics and can be heard here. 2. Mayor Ly represents the 0.1% of the California population who are Hmong and had no leadership until Ly was elected. 3. Mayor Ly's father participated in the Secret War in Laos. 4. Mayor Ly is a polished diplomat who once offered to mediate between the Siskiyou County Sheriff and the Hmong pot growers. 5. Mayor Ly is a smart man. Our Mayor travels out of state and makes a speech in an attempt to tarnish the cities reputation and undermine public trust in elected officials. It appears to me that the relations between Mayor Ly and the council will sour after this debacle and it's time we voters relieve Ly of his obligations come November. Perhaps a move to Wisconsin would serve his interests more to his liking.